Summer can be prime season for car thieves, as many people leave their windows down and engines running to keep vehicles cool. That’s why Amica Insurance is offering some tips to help prevent car theft. According to SaferCar.gov, there were nearly 690,000 vehicles reported stolen in the U.S. in 2014. Park in well-lit areas. 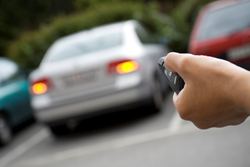 If it’s an attended parking lot, leave only the ignition/door key with the attendant. Lock the vehicle, and always bring the keys with you. Never hide a second set of keys in the vehicle. Keep valuables out of plain sight, and completely close the windows when parking. Park with the wheels turned toward the curb, so that it is difficult to tow the vehicle away. If the vehicle has rear-wheel drive, backing it into the driveway will also make it more difficult to tow. Leave business cards, address labels or other identification inside the vehicle, which will help law enforcement recover it if it’s stolen.